Van Hook’s love of the European tradition also began early. He spent two summers during high school filmmaking throughout France and England. This allowed him to visit many of the great museums, and further increased his commitment to become a professional artist. Following college, he left for Paris and spent nearly a year copying at the Louvre and travelling through France, Italy and Holland making numerous paintings “en plein air”. He returned to California, where he continued painting the landscape and figure out of doors. After marriage and the start of a family, George returned to the East Coast, eventually settling in Cambridge, NY, a beautiful nineteenth century village in the Hudson Valley. His wife is a Mycological Consultant for Ecovative. 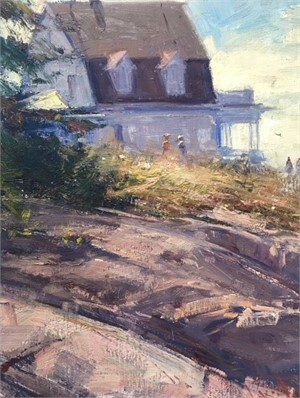 Their three daughters were often models for his paintings when younger, and are now grown and successfully independent. 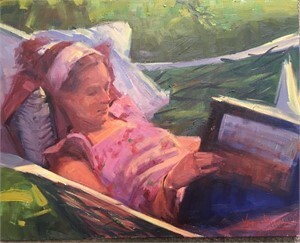 Van Hook was the 2014 Juror and Judge for the Connecticut Plein Air Society annual exhibition, was invited by Plein Air magazine to be a live instructor at the Plein Air National Convention, 2015 in Monterrey, CA. Liliedahl Productions and Plein Air Magazine released in 2014 a 90 minute instructional film, “How to Paint Impressionism Outdoors” by George Van Hook. View more of George Van Hook's Painting on our online marketplace. George Van Hook George Van Hook was born and raised in Abington, Pennsylvania, a northern suburb of Philadelphia. He began painting very early and was able to participate in the vibrant artistic culture of the region. 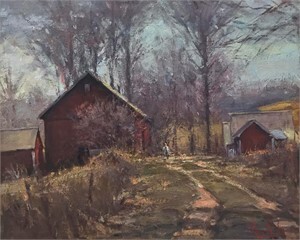 The family owned a farm in Bucks County, home of the Pennsylvania impressionists, and he became heavily influenced by their fine academic training coupled with a love of the prosaic landscape. Another early local influence was the “Brandywine Tradition”, the illustrative work of Howard Pyle and the generations of Wyeths. This was further enhanced by a close association with coastal Maine. 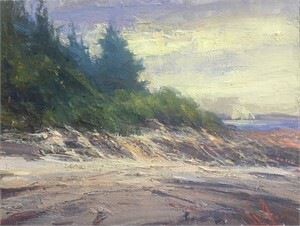 George has spent many summers painting in the mid-coast area of Rockland and Rockport Harbor, and on North Haven Island where his wife’s family owned property adjacent to the famous Boston artist Frank Benson. Van Hook’s love of the European tradition also began early. He spent two summers during high school filmmaking throughout France and England. This allowed him to visit many of the great museums, and further increased his commitment to become a professional artist. Following college, he left for Paris and spent nearly a year copying at the Louvre and travelling through France, Italy and Holland making numerous paintings “en plein air”. He returned to California, where he continued painting the landscape and figure out of doors. After marriage and the start of a family, George returned to the East Coast, eventually settling in Cambridge, NY, a beautiful nineteenth century village in the Hudson Valley. His wife is a Mycological Consultant for Ecovative. Their three daughters were often models for his paintings when younger, and are now grown and successfully independent. Van Hook thinks of his paintings as primarily a visual response to the selected environment, be it landscape, figure or still life. “I want the color to be beautiful and the drawing firm and secure”, he says. The paintings are a marriage of external and internal forces – what emerges on the canvas should be a reflection of both the beauty of the world and the artist’s most inner response. For the last five years, Van Hook has been involved in Plein Air competitions, and has won numerous awards. They include: 2012 Plein Air Vermont, Bennington, VT — Second Place | Artists’ Choice Saranac Lake Plein Air— First Cash Prize 2013 Finger Lakes Plein Air, Canandaigua, NY— Best of Show | First Place Quick Draw Billsboro Plein Air, Geneva, NY— Best of Show Saranac Lake Plein Air— Best of Show 2014 Finger Lakes Plein Air, Cananadaigua, NY— First Place Quick Draw | Peoples’ Choice Ocean Park Plein Air, Ocean Park, ME— Best of Show Bennington Plein Air, Vermont— Best of Show Seneca Lake Plein Air— First Place Quick Draw | Peoples’ Choice Van Hook was the 2014 Juror and Judge for the Connecticut Plein Air Society annual exhibition, was invited by Plein Air magazine to be a live instructor at the Plein Air National Convention, 2015 in Monterrey, CA. Liliedahl Productions and Plein Air Magazine released in 2014 a 90 minute instructional film, “How to Paint Impressionism Outdoors” by George Van Hook. “I've always been influenced by the power of images to express ideas and emotions. Painting is a process of discovery and decision making where disparate elements pull together until the image is clearly expressed. Ultimately my concerns are with the expressive qualities of light captured with paint. 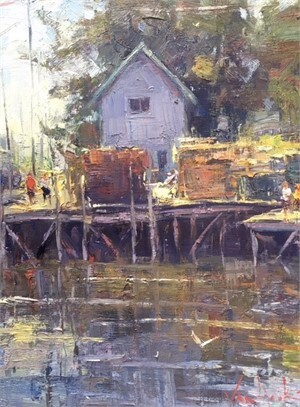 Contemporary Impressionism best describes my style.” View more of George Van Hook's Painting on our online marketplace.